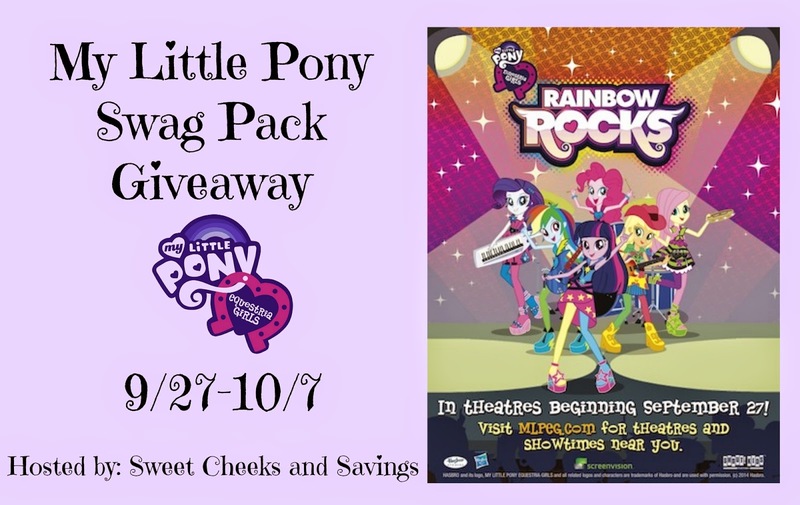 Little Helpers in Life: My Little Pony Swag Pack Giveaway Hosted by: Sweet Cheeks and Savings! My Little Pony Swag Pack Giveaway Hosted by: Sweet Cheeks and Savings! Who is excited for My Little Pony Equestria Girls: Rainbow Rocks? I know I am one Momma that will seeing this movie! What's next best to seeing the movie? Winning some SWAG!!!! This swag pack include a copy of the movie theater poster, stickers and tattoos! Enter the giveaway by using the Giveaway tool below! Good Luck! Prize: My Little Pony Swag Pack including a movie poster, stickers and tattoos. Dates: Starts September 27, 2014 6:00 pm EST. Winner will be chosen October 7, 2014 11:59 pm EST. Disclosure: Sweet Cheeks and Savings teamed up with Shout Factory for this giveaway. Other participating bloggers are not responsible for choosing the winner or shipment of product. They have not receive any compensation for this post. This giveaway is in no way associated with Facebook, Twitter, or Pinterest. The winner will be chose at random by the Giveaway Tool and emailed. The winner must claim the prize within 48 hours or they risk forfeiting the prize.